Chandrashila (means "Moon Rock".) peak at 3950 meters is a popular trekking destination of the region. Trek to Chandrashila summit starts from Chopta but steep climb starts from Tunganath. At height of over 12,000 ft, Tungnath is the highest of the Panch Kedars but reaching Tunganath is quite easy. 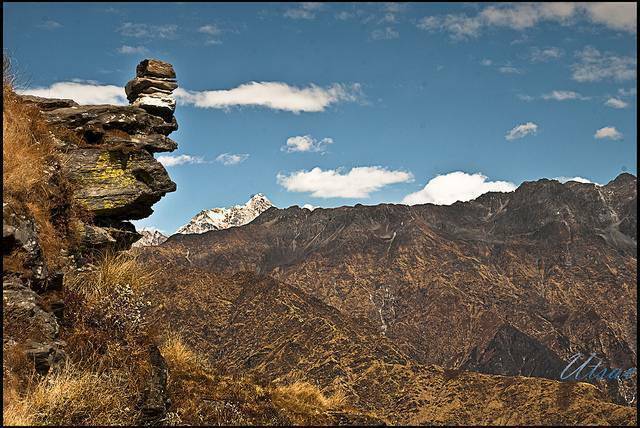 The main attraction here is the unrivalled views of the Himilayas. From Chandrashila summit tourists get a spectacular view of Himalayan peaks like Bandarpunch, Nandadevi, Kedar Peak, Chaukhamba, Trishul and other un-named peaks. There is a legend that Lord Rama meditated at the peak of Chandrashila after he defeated a demon god.